Percolation mires occur in landscapes with a large water supply very evenly distributed in time, and with water losses by evapotranspiration and run-off not - not even periodically - exceeding supply: the water level does not drop and the peat remains weakly decomposed, with large pores, and elastic. Until now, these conditions have been thought to be restricted to groundwater fed systems. Theoretical considerations, however, indicated that percolation mires could exist which are only fed by rainwater (Couwenberg & Joosten 1999). The following characteristics were predicted for such "percolation bogs" (cf. Kaffke et al. 2000; Haberl et al. 2006): the precipitation surplus is large and evenly distributed over the year; the mire has a convex shape (indicating ombrogenity); the bog lacks clear patterning because the development of hummocks and hollows depends on lateral water flow (cf. Couwenberg & Joosten 1999, 2005); the vegetation is acid, possibly more nutrient rich than 'normal' bogs because of rheothrophy effects; the peat is hardly decomposed over a large depth. The Kolkheti wetlands of western Georgia (“Colchis”) with their subtropical climate seemed ideal for the formation of percolation bogs and were, therefore, searched for this mire type. It was discovered that the peatland Ispani 2 near Kobuleti fullfills many of the predicted criteria and was therefore declared to be the first discovered percolation bog worldwide (Kaffke et al. 2000; Matchutadze & Joosten 2003; Matchutadze & Krebs 2003; Haberl et al. 2006). A second percolation bog is the Imnati peatland near Poti, to the north of Ispani 2 (Haberl et al. 2006). 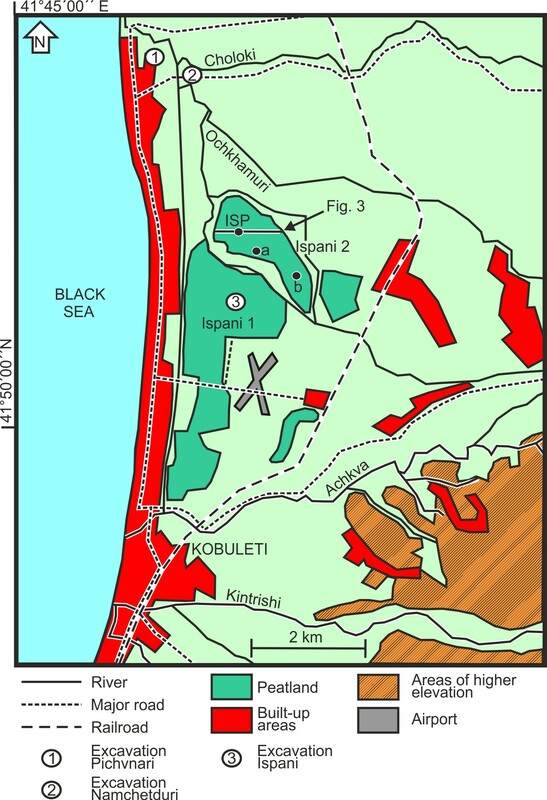 The Kobuleti area includes both mires “Ispani 2” and the greatly degraded “Ispani 1”, for which it is suspected that it also used to be a percolation bog. Furthermore, the region is well-known for its important archaeological excavations of Pichvnari and Namchetduri, as well as a settlement buried below the peats of Ispani 1. This setting provided a unique opportunity for investigation of wetland development within the context of dryland vegetation history influenced by human culture. Prior to 5400 cal yr BP, the Ispani basin was a floodplain of an active river system where overbank deposits with fluvially transported pollen attributable to Castanea were deposited. Subsequently, a lake or lagoon developed in which reeds expanded. These were succeeded by herb-rich open alder carrs. After 1900 cal yr BP, Carpinus and Fagus expanded on the dry grounds, where formerly Quercus was more abundant. Also Castanea declined. Local reedbeds, that burned regularly, succeeded the alder carr. After 1000 cal yr BP, a percolation bog developed resulting in the formation of 4 m of loose, porous, and largely undecomposed Sphagnum imbricatum peat with Molinia roots, with an extreme high peat accumulation rate of 4 mm/year. The pollen and macrofossil record indicate that during the last ca. 1000 years - the phase of the percolation bog - the vegetation remained predominantly stable. Only during the last century prominent changes occured due to large-scale human impact on the landscape (cf. Joosten et al. 2003).A peculiar vegetation element in the southern part of Ispani 2 is the occurrence of a population of Calluna vulgaris wide outside the general distribution area of this species, and the only known occurrence in Georgia (Kaffke et al. 2002). This research is carried out in close cooperation with Andreas Haberl, Hans Joosten, Andreas Kaffke, Matthias Krebs, Merten Minke, Izolda Matchutadze and Jenny Schulz. Connor, S.E., Thomas, I. & Kvavadze, E.V. (2007): A 5600-yr history of changing vegetation, sea levels and human impacts from the Black Sea coast of Georgia. The Holocene 17: 25-36. De Klerk, P., Haberl, A., Kaffke, A., Krebs, M., Matchutadze, I., Minke, M., Schulz, J. & Joosten, H. (2009): Vegetation history and environmental development since ca. 6000 cal yr BP in and around Ispani 2 (Kolkheti lowlands, Georgia). Quaternary Science Reviews 28: 890-910. Dzhanelidze, Z.Ch. & Mikadze, I.P. 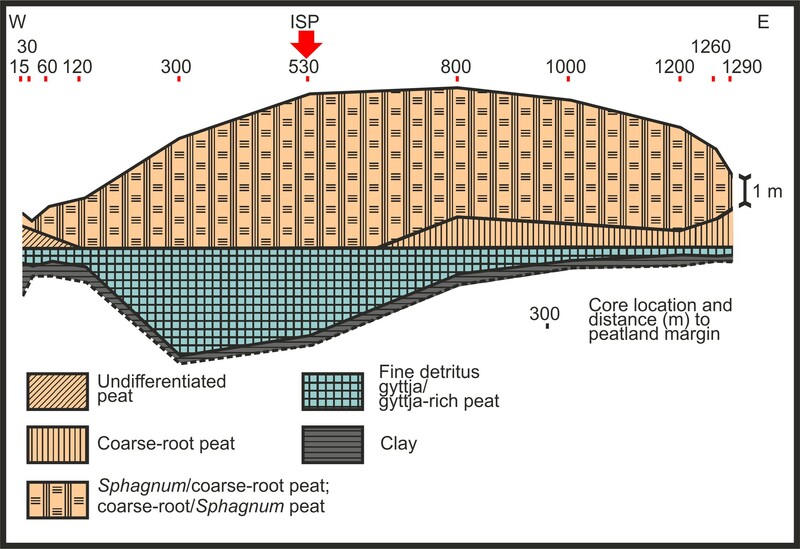 (2007): Stratigraphy and water supply conditions of the Kobuleti peat bog. Stratigraphy and Geological Correlation 15: 437-439. Kaffke, A. (2008): Vegetation and site conditions of a Sphagnum percolation bog in the Kolkheti Lowlands (Georgia, Transcaucasia). Phytocoenologia 38: 161-176. Kaffke, A., Couwenberg, J., Joosten, H., Matchutadze, I. & Schulz, J. (2000): Ispani II: the world's first percolation bog. In: Crowe, A., Campeau, S. & Rubec, L. (eds. ): Québec 2000 Millennium wetland event: program with abstracts. Québec: 487. Kaffke, A., Matchutadze, I., Couwenberg, J. & Joosten, H. (2002): Early 20th century Russian peat scientists as possible vectors for the establishment of Calluna vulgaris in Georgian Sphagnum bogs. Suo 53: 61-66. Krebs, M., Kaffke, A., de Klerk, P., Matchutadze, I. & Joosten, H. (2009): A future for Ispani 2 (Kolkheti, Georgia) and adjacent lands. International Mire Conservation Group Newsletter 2009/2: 3-14. Matchutadze, I. 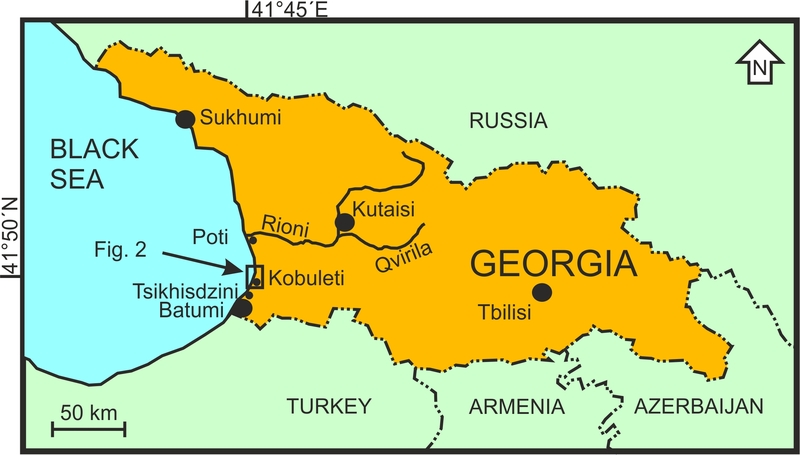 & Krebs, M. (2003): News from Georgia: Ispani threatened by road construction. International Mire Conservation Group Newsletter 2003/3: 36. Couwenberg, J. & Joosten, H. (1999): Pools as missing links: the role of nothing in the being of mires. In: Standen, V., Tallis, J. & Meade, R. (eds. ): Patterned mires and mire pools - origin and development; flora and fauna. British Ecological Society, Durham: 87-102. Couwenberg, J. & Joosten, H. (2005): Self-organization in raised bog patterning: the origin of microtope zonation and mesotope diversity. Journal of Ecology 93: 1238-1248. Haberl, A., Kahrmann, M., Krebs, M., Matchutadze, I. & Joosten, H. (2006): The Imnati mire in the Kolkheti lowland in Georgia. Peatlands International 2006/1: 35-38. Joosten, H., Kaffke, A. & Matchutadze, I. 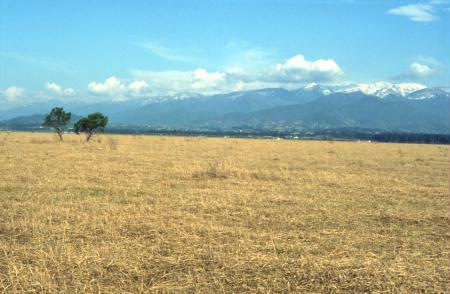 (2003): The mires of the Kolkheti lowlands (Georgia). International Mire Conservation Group Newsletter 2003/3: 19-23. Krebs, M. & Gaudig, G. (2005): Torfmoos (Sphagnum) als nachwachsender Rohstoff - Untersuchungen zur Maximierung der Produktivität von Sphagnum papillosum im Regendurchströmungsmoor Ispani 2 (Georgien). Telma 35: 171-189. Krebs, M. & Joosten, H. (2006): The Golden Fleece in trouble - the endangering of the Kolkheti peatlands (Georgia). International Mire Conservation Group Newsletter 2006/1: 6-9. Matchutadze, I. (author) & Joosten, H. (editor) (2003): Kolkheti mires. Tchaobi Society for Conservation of Wild Nature. Makhindjauri, 40 pp.